Here's what Colin had to say about the disco dome he hired for his sons Christening party in Bourne. Another happy customer!...................... "We had a disco dome bouncy castle today for our sons christening and it was excellent the people were very helpful and polite could ask any more would use them again highly recommend"
Another really treasured review. This one is from Nikki who runs one of our local halls and a local playgroup. Nikki knows how nice our equipment is and how clean we keep it and always recommends us to potential customers. The playgroup have become very regular customers and have hired lots of different equipment including the soft play party, tots activity castle and pups bouncy and slide bouncy castle. Thanks Nikki! x............... "Absolutely fantastic company. Reliable, friendly, easy to book and pay. Clean and well kept castles and soft toys. Hassle free booking. Highly recommended to all." Claire ordered our ultimate party package with the princesses bounce and slide bouncy castle for her party in Bourne. She also had the didi cars and sweetie stand. Claire was really pleased with her party and has since rebooked for her other daughters' party........................... "Absolutely fantastic service, easily contacted and very reliable. The castle was immaculate and the wiggle cars were great fun for the kids. Thank you. Highly recommended." Kimberley chose our ultimate bouncy castle package with the superheroes bounce and slide bouncy castle and added a sweetie stand to her party in Northborough. The kids had a blast and Mummy found our service very efficient and good value for money. Win - win :-) ..............."Absolutely brilliant service! My boys had an amazing party thanks to these guys "
Bee-doh bee-doh the Minions have arrived at It's Fun Time! Do your children want to go "Bananas" with the minions? Then this is the perfect bouncy castle for them! 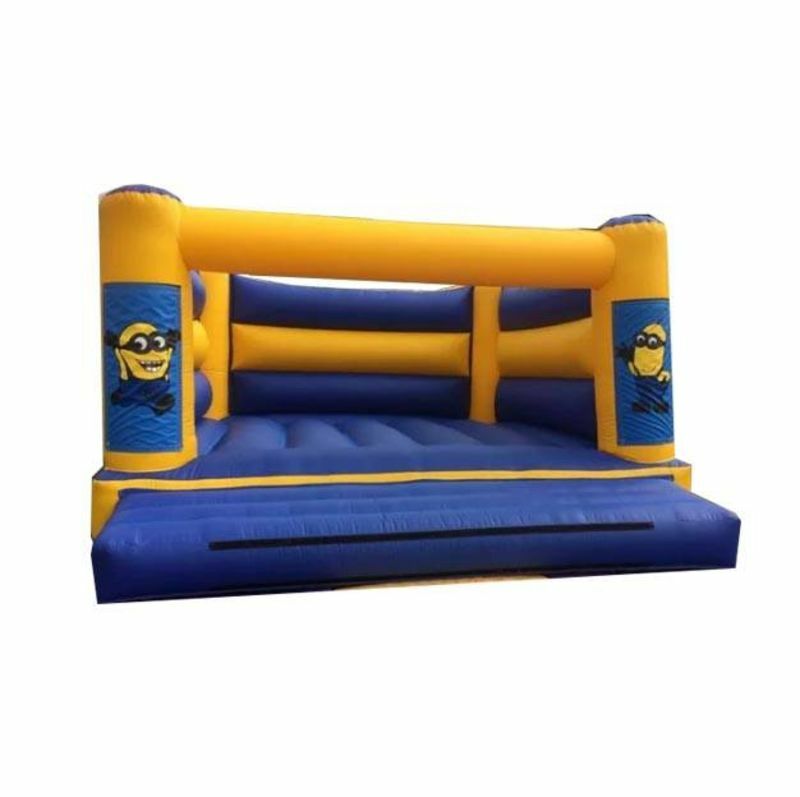 Our giant Minions bouncy castle boasts a huge 16ft X 16ft bouncing area and beautifully painted artwork featuring Minion Dave and his friends. 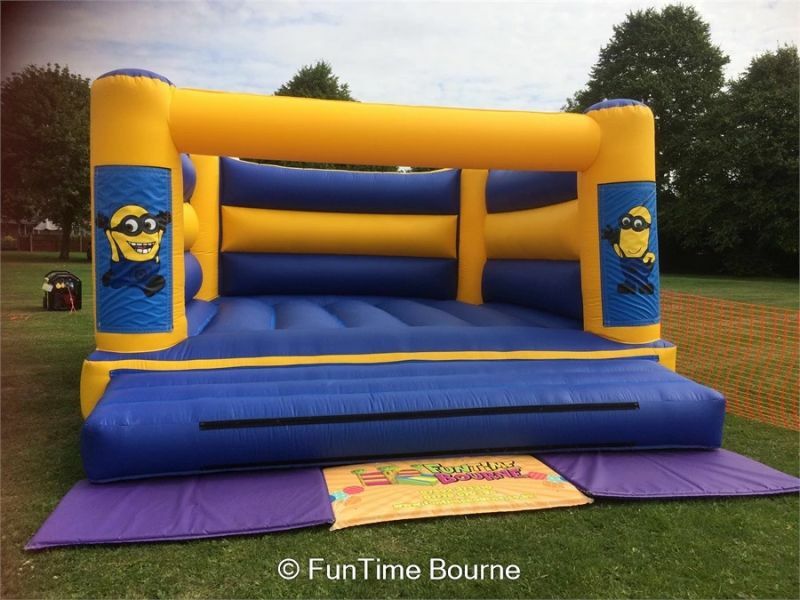 Have a look at our other bouncy castle hire in Bourne. This lovely large and modern castle is an excellent choice for birthday parties, school fetes or any other event. The Minions are loved by all and inoffensive to boys and girls so a great choice for public events. Here at It's Fun Time we specialize in low height bouncy castles so this particular castle will fit in most local village halls at only 9ft high. This particular castle also boasts removable artwork themes so we can also supply superheroes bouncy castles, princess bouncy castle and party themed bouncy castles in Bourne and surrounding areas. Please do make sure that this bouncy castle will fit in your chosen venue prior to booking If your are unsure, please do contact us, or give as a ring on 07592 373310 and we may be able to advise. If you are looking to use this bouncy castle for a public event or school fete, why not add a disco dome and candy floss cart to ensure your event is a success?